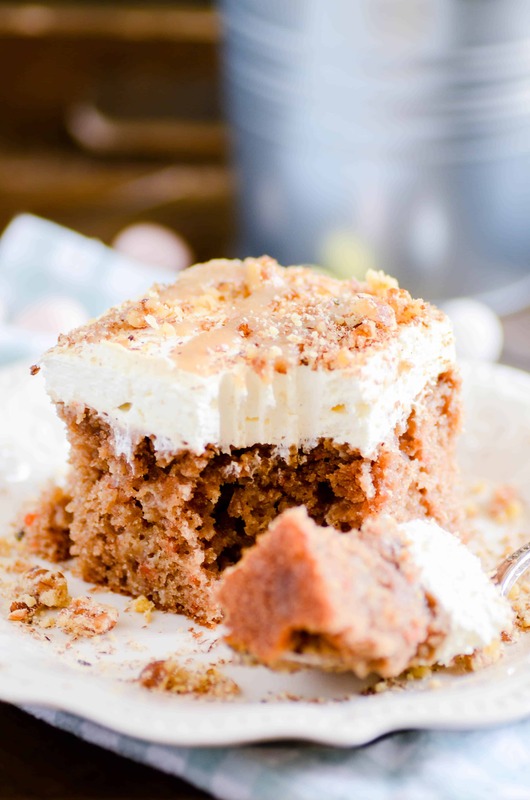 Carrot cake soaked in a homemade caramel sauce topped with a cream cheese whipped topping. This is an Easter show stopper! 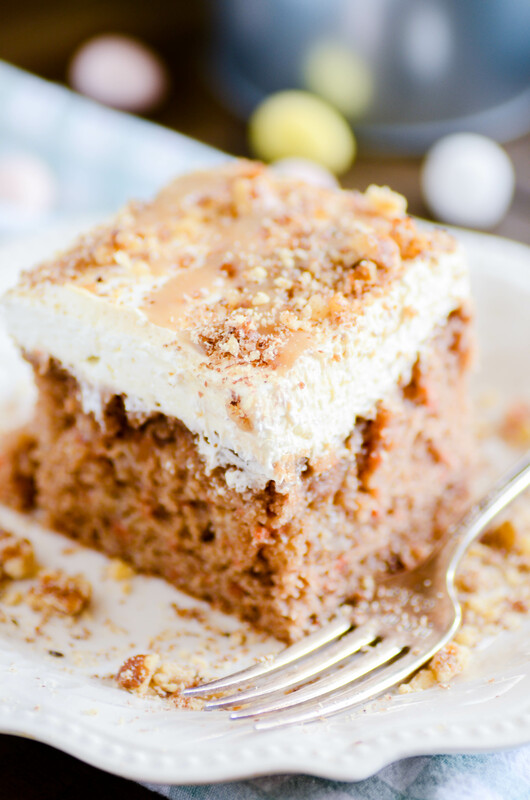 If you think you don’t like carrot cake, give this Carrot Cake Poke Cake a try. I’ve made this cake both with homemade caramel and with store bought caramel sauce. They are both VERY good. But I definitely felt like the homemade caramel sauce took the cake to another level. And the caramel sauce really doesn’t even take that long to make from scratch, so I can’t think of a good reason not to try it! I HATE carrot cake. Mostly because I hate chunks of carrots in my cake and I loathe raisins. However, I’ve discovered that I really like carrot cake made with a Betty Crocker cake mix. I’ve also discovered that I love carrot cake when it’s paired with caramel. 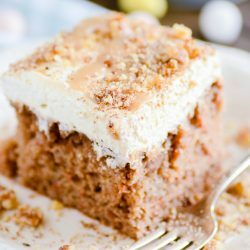 So if you think you don’t like carrot cake, give this one a try. It’s very, VERY important that the cream cheese be COMPLETELY softened to room temperature before you whisk it. Otherwise, you’ll end up with chunks in your whipped topping. Alternately, you could simply use whipped cream cheese to start with! It’s hard to choose between the homemade caramel filling and the cream cheese whipped topping!! It’s all SO good. Poke holes all over the cake using the bottom of a wooden mixing spoon. Pour the caramel sauce over the cake (pour it while it's still warm if you made it from scratch), aiming for the holes. If desired, reserve some sauce for drizzling over the top of the cake. Using an electric mixer, whisk the cream cheese and sugar until smooth. Mix in the Cool Whip. Use a rubber spatula to make sure you've scraped all the cream cheese from the bottom of the bowl and thoroughly mixed. Spread the Cool Whip mixture over the top of the cake. Top with the crushed walnut and caramel drizzle. Chill for at least 3 more hours before cutting and serving. *I really like Smuckers Simple Delight Salted Caramel Sundae Sauce!